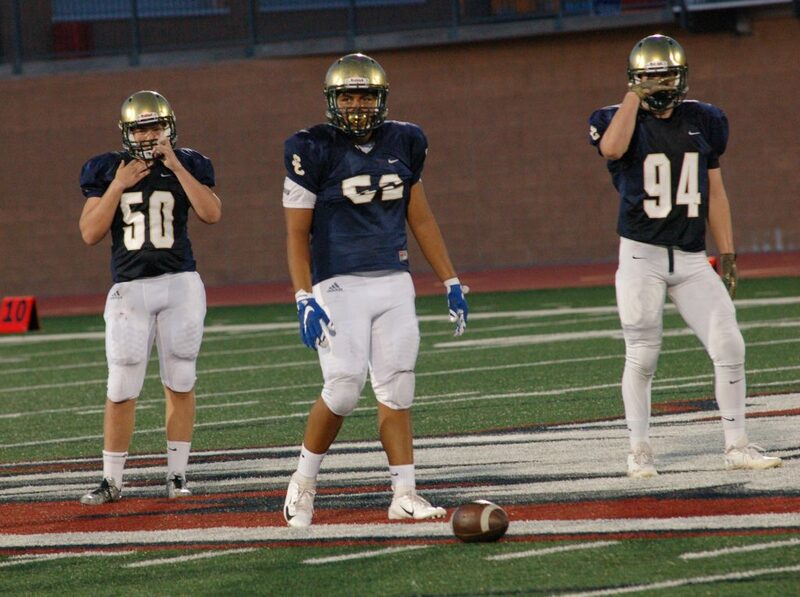 ST. GEORGE — Region 9 football’s opening night featured plenty of scoring action, three wild last-second finishes, and some weather delays that ended one contest early and pushed a couple others past 11 p.m. Of the seven 4A schools in Region 9, only Snow Canyon came away with a win Friday evening. 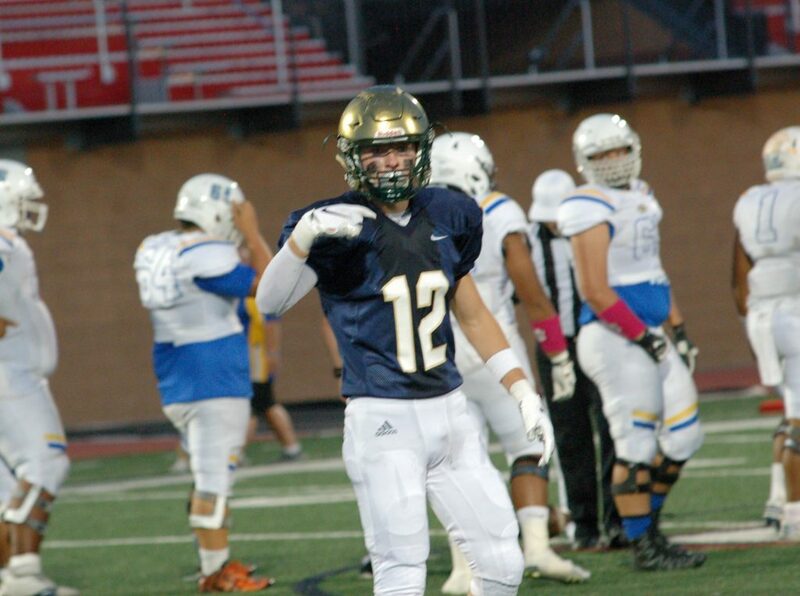 Snow Canyon senior Carson Holyoak intercepted a pass and ran it back 100 yards for a touchdown in overtime, giving the Warriors a dramatic comeback win over Taylorsville. 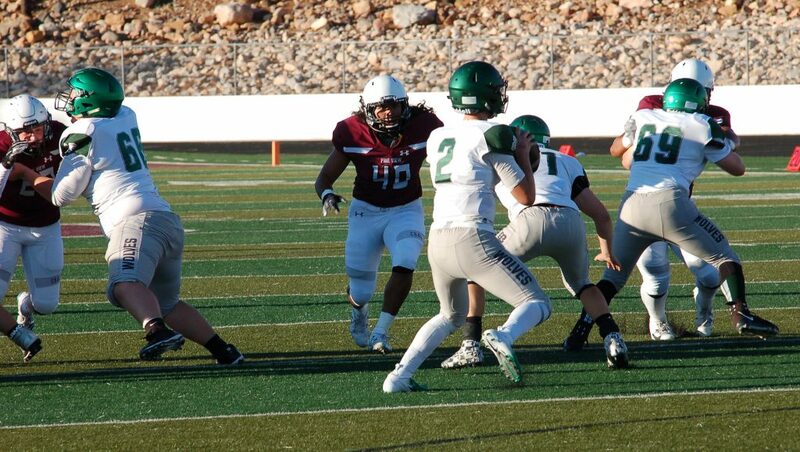 Friday’s matchup of the two Warriors squads took place at Dixie State University’s Trailblazer Stadium because Snow Canyon’s new home field is not quite ready for play. Taylorsville QB Dane Leitualea gave his team an 8-0 first-quarter lead, thanks to a 1-yard TD run followed by a 2-point conversion run. Successive Snow Canyon TDs in the second quarter by Ryan Bethers and Bretton Stone made it 13-8, but Taylorsville soon tacked on another 8 points, thanks to a TD pass by Leitualea, who added another 2-point conversion run to give Taylorsville a 16-13 halftime lead. Taylorsville then scored two more TDs in the third quarter, both on lengthy runs, to pull ahead 29-13. 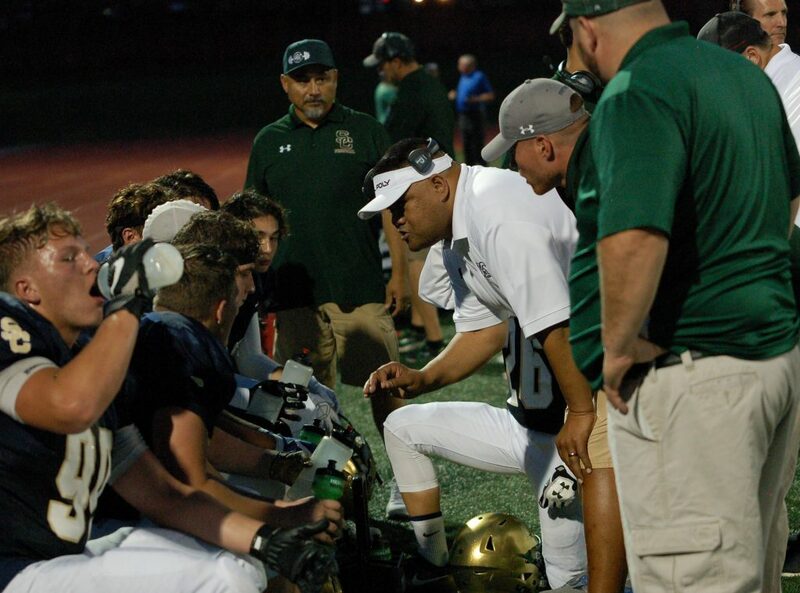 However, Snow Canyon QB Landon Frei threw a 24-yard TD pass to Austin Anderson early in the fourth, and Stone scored on another TD run later in the quarter to narrow the deficit to 29-26. 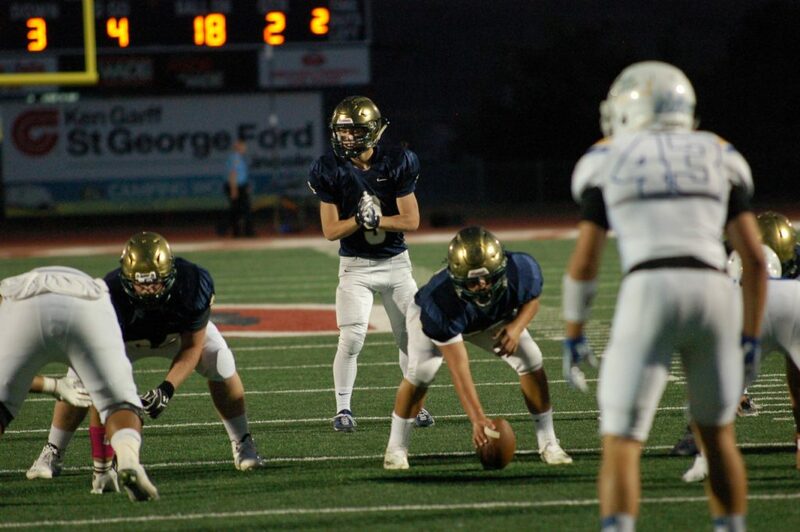 Snow Canyon’s improbable comeback continued with a 19-yard FG by kicker Matt VanGils that tied the game 29-29 in the final seconds of regulation, which forced overtime. 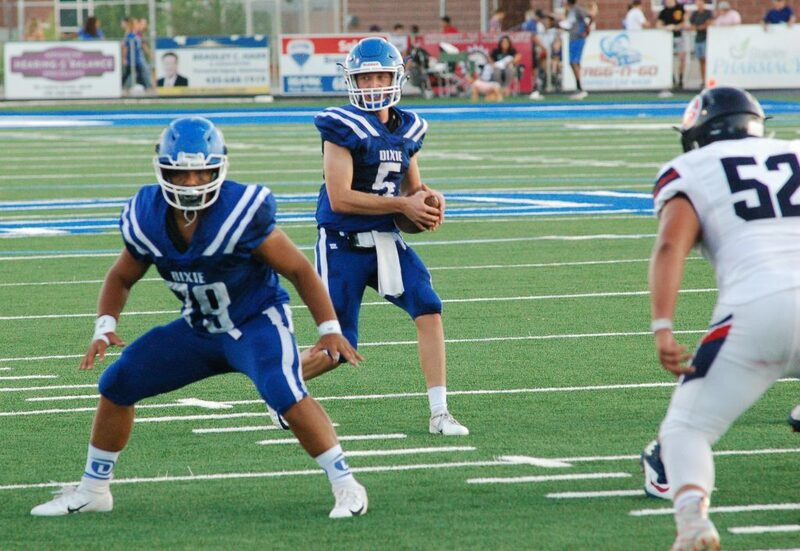 At Dixie High, the Flyers gave up two touchdowns in the final minute to lose a heartbreaker to Springville, 26-21. 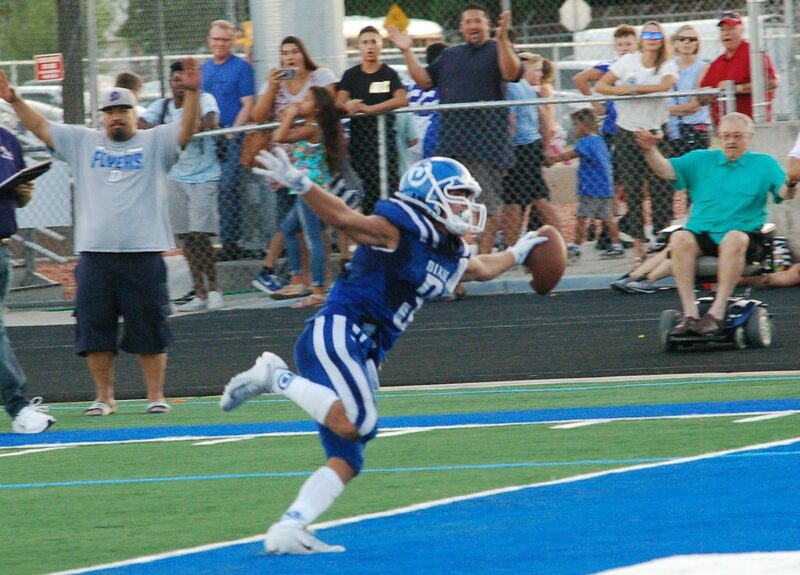 Dixie opened up an early 7-0 lead, thanks to a 55-yard TD pass from QB Reggie Graff to Tyson Miller. The Red Devils answered with a 90-yard kick return by Austin Mortensen. The PAT kick missed, leaving Dixie ahead 7-6. The Red Devils then scored on a 9-yard run by Rylan Poulson. The 2-point conversion attempt failed, however, leaving Springville up 12-7. Late in the second quarter, Dixie’s Graff ran an option up the middle for a 60-yard TD, with the ensuing PAT putting the Flyers up 14-12. Graff then finished up a long drive by connecting with wide receiver Nate Mahi for a TD pass a few minutes later, giving the Flyers a 21-12 halftime lead. Neither team scored again until 1:02 left in the fourth quarter, when Springville QB Payton Murphy found receiver Clayton Johnson in the end zone for a TD. Springville then recovered the onside kick, and Murphy connected with Johnson again on a 21-yard TD reception with 0:03 remaining, giving the Red Devils the 26-21 comeback win. At Beaver, the Falcons took on the Beavers, winners of the 2A state title in 2016 and runners-up last year. 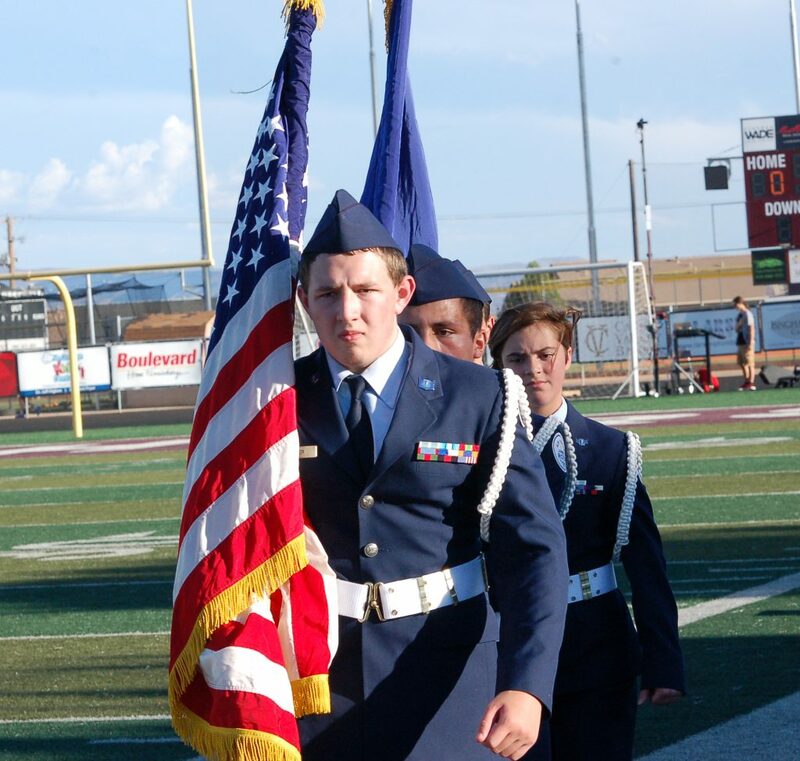 Canyon View senior Brady Lowry helped put the Falcons on the board first, thanks to an interception that set up a seven-yard TD run by Colton Shumway to give Canyon View a 6-0 lead late in the first period. Multiple lightning delays postponed the game more than an hour. On the first play of the second half, Beaver’s Hunter Carter ran back the kickoff 90 yards for a TD, and the PAT kick by Dylan Bartlett gave the Beavers a 7-6 lead. Neither team scored in the third quarter, but Beaver QB Ryker Albrecht threw a 75-yard TD pass to Hunter Carter to put the Beavers up 14-6 early in the fourth. Canyon View later got another rushing TD by Shumway from five yards out, and converted the 2-point attempt to tie the game 14-14 with about seven minutes left. Beaver then pulled back ahead 21-14 with a five-yard run by Albrecht with under three minutes left, and the Beavers were able to hold on for the win. 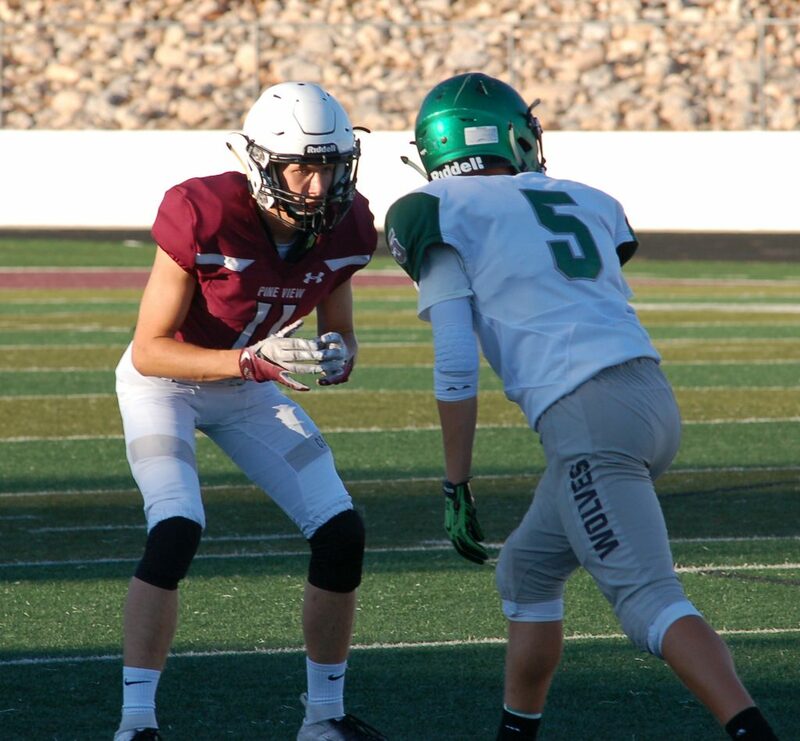 In a back-and-forth high-scoring battle, Green Canyon prevailed on Pine View’s home field, outdueling the Panthers 45-38. With just under four minutes left in the second quarter, Pine View’s Tosh Wright rushed for a 43-yard TD to bring the Panthers within a touchdown, 24-17. Green Canyon outscored the Panthers 14-7 during the third quarter to take a 38-24 lead heading into the final period. However, Pine View scored successive TDs on 1-yard runs by Dallin Brown and Wright (each player’s second TD of the game) to tie the game at 38-38 late in the fourth quarter. However, with 12 seconds left, Green Canyon’s Brett Gasaway scored his fourth touchdown of the night and put the Wolves up by seven once again. 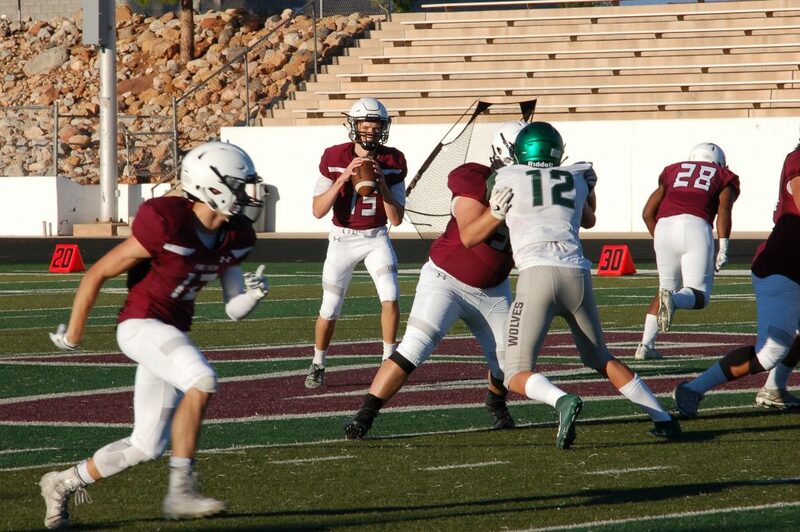 Pine View’s last-ditch Hail Mary attempt failed, giving Green Canyon the 45-38 victory. At Provo, the Bulldogs made it a long night for the Redmen. Provo scored first on a TD early in the first quarter to make it 7-0. The Bulldogs later piled on three more TDs to take a 31-0 halftime lead. 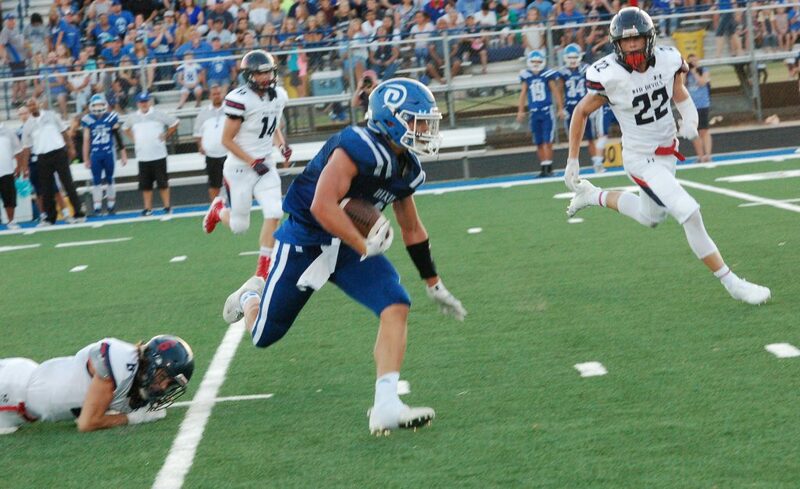 After rain and lightning delayed the start of the second half, Provo’s Dallin Havea scored his second rushing TD of the game to give the Bulldogs a commanding 37-0 lead. 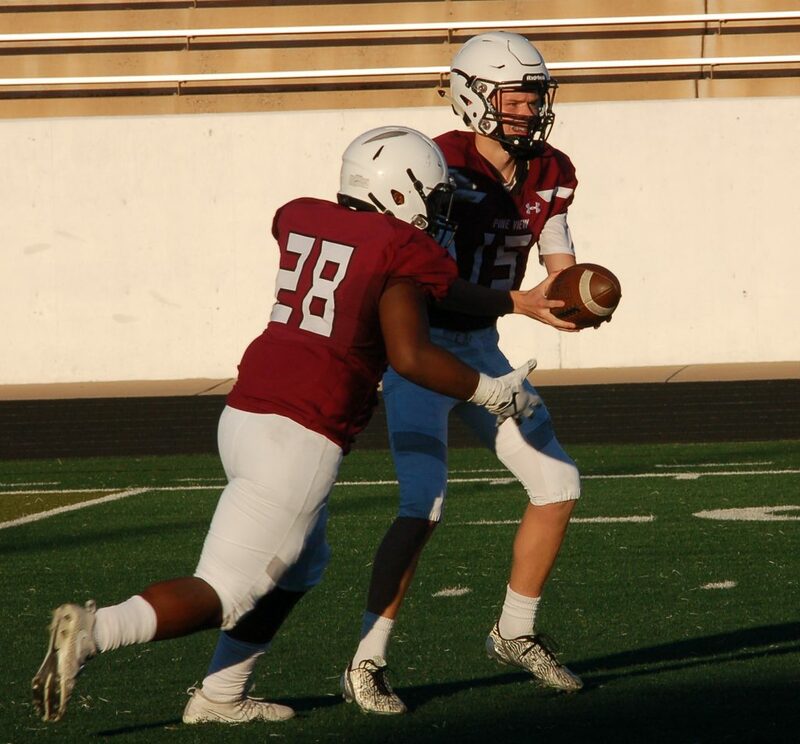 Cedar finally broke the shutout in the fourth quarter when Tayvien Brown caught a 9-yard TD pass from Jaxon Garrett to account for the final score of 37-7. 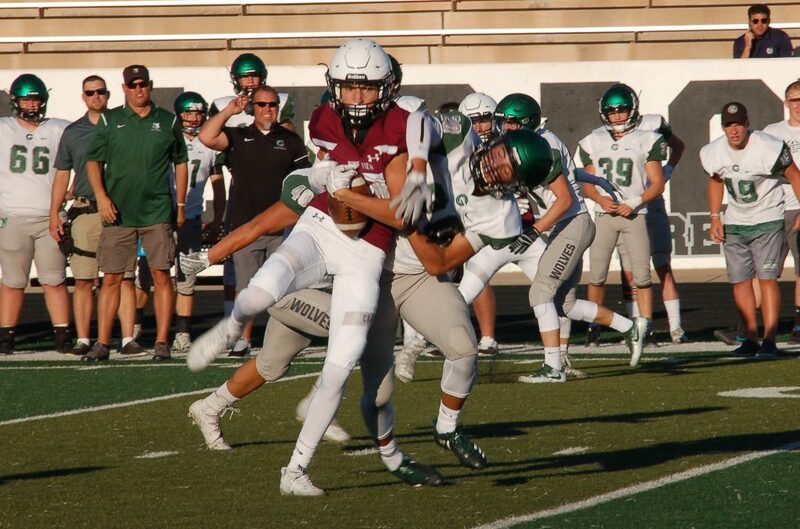 At Salt Lake City, the Highland Rams led Desert Hills 7-0 at halftime, but the Thunder tied the game in the opening seconds of the third quarter, thanks to a fumble recovery that set up a 20-yard TD pass from Logan Wilstead to Kaige Baird. 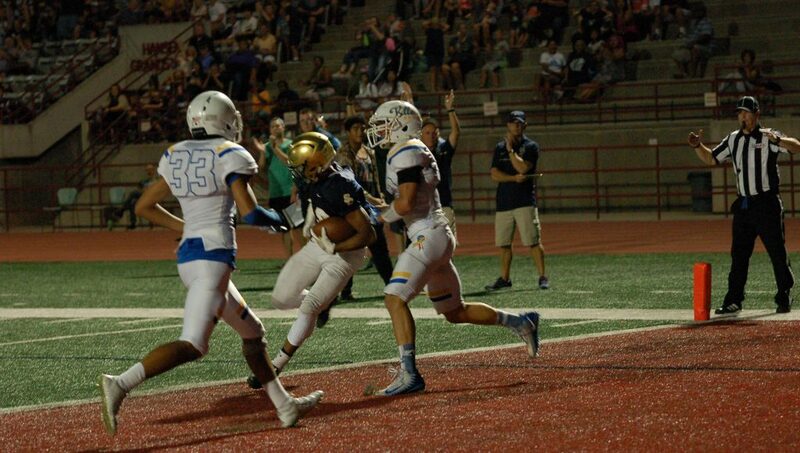 Highland then responded with a 70-yard drive that culminated in a touchdown, giving the Rams back the lead, 14-7. Shortly thereafter, with just over five minutes left in the third quarter, officials called the game due to lightning and stormy weather. At Hurricane, the Tigers opened up an early 6-0 lead, thanks to QB Brock Starley’s 61-yard TD pass to Ian Lambert. The Bruins, however, went on to score 17 unanswered points, including a pair of TDs in the second quarter, to take a 17-6 halftime lead. Mountain View went on to score two more TDs in the second half, with the Bruins securing the 31-6 win by shutting out the Tigers the remainder of the game.